This is an ancient luxury family of the 17th century, overlooking the Chianti hills and the ancient town of Impruneta, 2 km far (about one mile) and 15 minutes from the center of Florence (15 km). Is an exclusive Villa restored according to the authentic tuscan tradition. Ideal for families or private individuals, large private garden, 5 bedrooms with en-suite bathrooms with shower, WI-FI, A / C in bedrooms, bathroom with bathtub on groundfloor. The property is a paradise of peace and quiet. The garden, the pool and the inner road are all private and not shared. 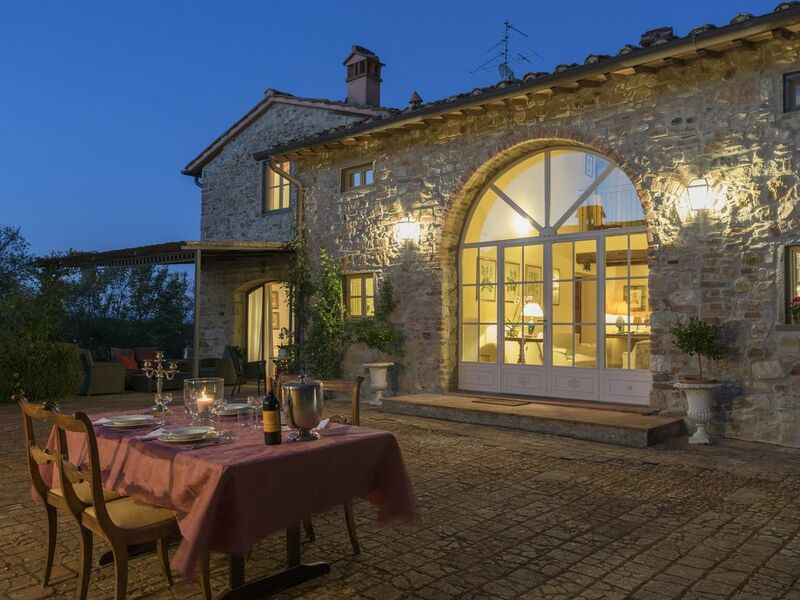 For those seeking a memorable holiday discovering the pleasures of this tuscan Villa has it all. The large villa (350 square meters), built in stone and brick, with a terracotta tiled roof, is located in a privileged position, surrounded by a total tranquility of the countryside. one mile from the town of Impruneta which is easily reached on foot and where you can spend many enjoyable evenings, find all the amenities: excellent restaurants, gelaterias, pharmacy, bars , wineries, bus transport in Florence, 30 minutes, supermarket, market stall twice a week for fresh fruit and vegetables, a fish stall once a week, coffe shop, bakery. Santa Maria Novella train station in Florence, Italy is about 9 miles from the villa, Peretola airport is 17 miles, and the motorway is 5 miles. The Villa is an ideal starting point for Tuscan towns such as Siena (37 miles), San Gimignano (30 miles), Greve in Chianti (9 miles), Lucca (54 miles) and Pisa (57 miles) . Impruneta also boasts two tennis courts, a beautiful golf course and a horse back riding club. On the first floor the bedrooms: 5 double bedrooms all with en-suite bathrooms with window and an enclosure shower, air conditioning, 1 of these with twin beds (can be made into double); 4 bedrooms have a fireplace inside. On the ground floor at the room, open plan living and dining room with a dishwasher, fridge and dishwasher, microwave, oven, coffee machine and espresso machine every tools you need, a bathroom with a bath tub, and a sitting room with a large antique tuscan fire place, wood and Satellite TV 55 inch screen with DVD player. We also have baby equipment (cot and high chair). The unique location will be immersed in the most scenic areas of the Chianti region just 15 minutes from Florence. Within a short distance you will find Golf (Ugolino Golf), horse riding, as well as many wineries which offer wine tasting. The paved road from the villa to the town is ideal to take walks or jogs. Three different "Logge" (three outdoor areas to sit and relax): one with Thai-sofa and table to enjoy a good glass of wine, reading a book and a table for 10 people an other on the ancient "aia" with a small table and an other on the back, in front of the kitchen. just few steps to the villa you can find the panoramic pool (10x5 mt depth 1.40 mt) with a large patios and umbrellas, sun beds, towels for a pool. In the garden you can find a BBQ and two bikes, to do mountainbiking through the beautiful tuscan hills. The main products of the property is olive oil. More than 900 olive trees all around. More than 40 acres of land. THE WHOLE PROPERTY IS RESERVED FOR OUR GUESTS, IS NOT SHARED BETWEEN OTHERS GUEST OR ANYBODY ELSE, the depandance in front of the villa is closed. Privacy and relaxation are guaranteed. Swimming pool and two large patios. Our guests have the entire garden and two mountain bikes. There is an adjacent dependence which is closed and empty. This villa is strategically located, it is surrounded by nature, it is just a few minutes from Impruneta, ancient hamlet, famous for the production of the renowned terra cotta (where you can find Restaurants , Postal Service, Bancomat, Bus Stop for Florence, Pharmacy, Tobacco Bar, Supermarket ..) and 15 minutes by car from old town of Florence and just few minutes to restaurants and winery Wine) which winds its way through the wine country of Chianti from Florence to Siena. Many activities can be arranged, mountaibiking, golf (running, walking, art tours, wine tasting and also our "Green Tuscan Gold", the Olive oil. We think you're having a comfortable holiday. Anyway in the town of Impruneta our guests can find all they need: Bus stop also to Florence, Postal Service, Restaurants, Bancomat, Pharmacy, Tabacchi Bar, Supermarket ans an ideal starting point for natural and cultural routes. Florence is just 15 km far, with the magnificent museum like Uffizzi Gallery. Few km from the Villa is to the city of Siena (60 km far) so you can easly reach the city of the Palio with its magnificent Piazza del Campo; Lucca about 1 hour and 30 min and Pisa, the same distance. In few minutes drive you can find the highway "Chiantigiana" connecting Siena to Florence through the valleys of Chianti so it is possible to visit the farm, castle and medieval villages. Some towns famous also for the wine: Greve in Chianti, Volpaia, Castellina in Chianti and Montefioralle. Others beautiful "borghi" near are Volterra, San Gimignano and if you like you can visit the area around Livorno, as Castiglioncello, Quercianella and also Bolgheri and Castagneto Carducci (2 hours driving), beautiful place full of history. My family and I enjoyed our stay at this wonderful Tuscan villa. I never got tired of looking at the vistas, whether I was inside the villa or outside. Caterina and family were so welcoming kind honest and helpful. I can’t sing there praises enough as great hosts. Rooms were spacious with comfortable beds. I can’t wait to go back in the spring/summer time to enjoy that magnificent pool. So if you’re looking to stay in a REAL Tuscan villa look no further than this villa that Caterina and family own. It truly is Heaven in Earth. Come and enjoy your time with family while making endless memories....... it’s priceless.!!!!!!! This villa is exceptionally beautiful and the area is very convenient for visiting the beautiful countryside and hilltop villages of Tuscany. Florence is close by and it is just twenty minutes or so by highway from the Florence airport. Our group of women had a fabulous time. Caterina and her family are very welcoming and will take care of any concerns immediately. I do not think I have every had such a wonderful experience with the owner of a property. This is the perfect spot for visiting Tuscany and for relaxing. Caterina arranged a cooking class for our group of women and it was exceptional. The chef, Camilla and her assistant Matteo were so enthusiastic and brought fresh and locally sourced ingredients for teaching us to make three kinds of pasta and sauces. We had a delicious meal and learned to make a semi-freddo desert. The wine was also wonderful. I would recommend a stay at this wonderful villa for any group of friends or family. The hospitality of the owners is totally exceptional. They are willing to assist you and arrange various tours and visits if you wish. Our group had more than one vehicle so we could stay at the villa and relax or go somewhere. It was the perfect vacation. Dear Ann, thank you so much for your wonderful words!You and your friends were a very good guests, respectful and friendly. Iam sure, we will meet again! Me and my family wait for you here again! Grazie di tutto! We had an exceptional stay at this property. Caterina was a lovely host, the location was excellent and the home is beautiful. The beds are comfortable and room size is fantastic. We were traveling with multiple families, and they were able to accommodate us perfectly with travel cots and highchairs for the little ones. We would return and hope to someday soon! We thoroughly enjoyed our experience at Catarina's long-owned family home. Catarina was responsive and thoughtful. She and her family generously shared their fresh-pressed olive oil from the harvest in progress. The house has lots of rooms and porches to spread out and relax, visit or work. We recommend taking up Catarina on the opportunity to enjoy a sumptuous home-prepared Tuscan meal. The homemade pasta was amazing! Impruneta is a great small town within walking distance. We would enjoy staying here again! Our time in this lovely villa was outstanding! We had three couples and had plenty of room. Caterina did a great job in arranging drivers for our day trips and a fun pasta cooking lesson in the villa! The views are beautiful! We highly recommend! Thank you very much Bart for your beautiful review. You were very good guests and took good care of our Villa, me and my family really are looking forward to welcome you again. We are also happy you enjoyed your day trip and cooking class! Thank you also for your nice gift, many greetings to all of you! This charming villa is the perfect spot to spend friends and family time in Tuscany!! Wonderful time and space with our family of 7, before we even arrived I knew we were in for a wonderful stay, Caterina emailed to make sure we were all set and gave local suggestions, we were thankful that we rented a car so we had the flexibility to go to other towns but spent 2 days just relaxing and enjoying the villa and the land surrounding. Celebrating a 50th birthday and 50th Anniversary this was the perfect holiday for all of us. Thank you very much Kelli for your beautiful words. You were very good guests and took good care of our Villa, me and my family really appreciated and are looking forward to welcome you again, thank you! Many greetings to you and your beautiful family! An ancient restored Luxury Villa of the 17th century overlooking the Chianti hills. Olive tree, from the same time is just a short distance (1 mile) from Impruneta (an ancient hamlet , famous for the production of the renowned terra cotta), find all the amenities: excellent restaurants, gelaterias, pharmacy, bars, wineries, bus , a market stall twice a week for fresh fruit and vegetables, a fish stall once a week, coffe shop, bakery. More than 900 olive trees all around and vineyards. THE WHOLE PROPERTY IS RESERVED FOR OUR GUESTS. Santa Maria Novella train station in Florence is 10 miles from the villa, Peretola airport is 17 miles, and the motorway is 5 miles. The Villa is an ideal starting point for Tuscan towns such as Siena (40 miles), San Gimignano (30 miles), Lucca (54 miles) and Pisa (57 miles).